The brand new issue of Fireworks Magazine is another classic. First off, we have an EXCLUSIVE interview with Blackmore's Night. 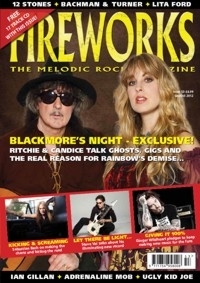 Spanning five pages, Ritchie and Candice talk about their new DVD 'A Knight In York', chat about ghostly encounters, classic practical jokes, how Blackmore's Night came to be… and they also add a little detail of the real reason why Rainbow disbanded, a tale never before told. To keep the Deep Purple connection alive, Ian Gillan takes time out to talk about the 'Who Cares' benefit album with Tony Iommi, and we have a rare interview with Purple's original bass player Nick Simper, who talks about his band Nasty Habits which pays homage to Deep Purple's early tunes. Not content with that, we have the reformed Ugly Kid Joe, rock wildman Sebastian Bach, guitar hero Steve Vai, Bachman and Turner, Adrenaline Mob and 12 Stones. 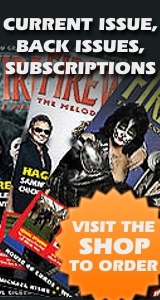 Michael Des Barres tells us about his return to rock with his new album 'Carnaby Street', Lit talk about tragedy and triumph, Lita Ford returns to the scene and Ginger from the Wildhearts gives 100% with his new album. That's all bolstered by an interview with Harem Scarem vocalist Harry Hess, melodic rockers Eclipse and a look back at Ozzy Obsourne's 'Speak Of The Devil' shows with Rudy Sarzo.